All transactions are safe and secure with a reliable history in online purchasing behind each of our associates. 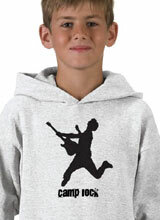 Buy the Camp Rock Hoodie Sweatshirt t-shirt to own Camp Rock clothing and merchandise. Whether you're about to "Start the Party" in Shane Gray's dance class, or light up your own stage as you sing along to the Camp Rock Karaoke CD, this comfortable light grey hoodie is the perfect clothing item to unleash your moves in. The zip up sweatshirt features a silhouette of Nate from the film pictured on the front. Add more movie clothes from the gallery to create the perfect gift. Choose one of the Camp Rock t-shirts or bundle the sweatshirt with one of the Shane or Mitchie Camp Rock singing dolls. You'll be ready to have your own Final Jam competition like in the movie. In addition to the Camp Rock Hoodie Sweatshirt tee above, browse the Camp Rock Clothing Gallery for more apparel like men's and women's clothes, kids shirts or hoodies.